I couldn’t believe my eyes ! I saw this first on Facebook but thought it would be another of those Photoshopped pranks but then thought to check it out myself and whoa!! 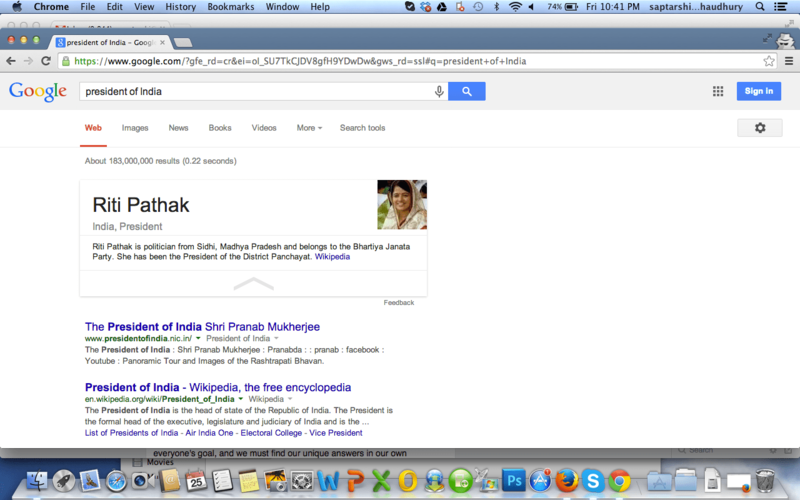 Google shows some unknown District Panchayat president, Riti Pathak’s name and details when you search for “President of India”. The entity search is completely screwed up..
By the time I completed the posts and redid the search that result is gone.. in fact it does not show any entity search results at all but shows the official site of Indian Govt. Not sure what triggered such a ridiculous results for the short while but it would be interesting to know how that happened.